Leading Manufacturer of pharmaceutical plastic spoons from Navi Mumbai. Our expertise enables us in offering quality proven array of Pharmaceutical Plastic Spoons, which is manufactured using supreme quality raw material and advanced machines. The range manufactured by us is in tandem with international quality standards and also available at industry leading prices. Moreover, these optimum quality plastic spoons can be customized in order to meet the varied requirements of the pharmaceutical industry. 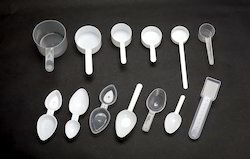 Looking for Pharmaceutical Plastic Spoons ?